We’ve just returned from completing a cartographic survey of this surreal island. Once your eye and mind adjust to the fact that most of it is a vast, volcanic desert, you begin to appreciate its surreal beauty. 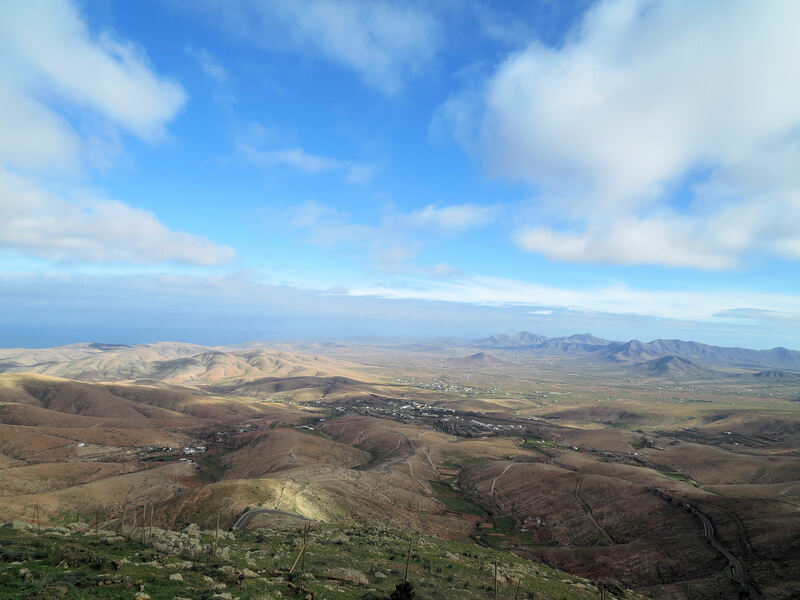 Central north Fuerteventura from the settlement of Time. There are few towns and settlements, so if volcanic cones, calderas and barrancos are your thing, it is a ‘must-see’ destination. 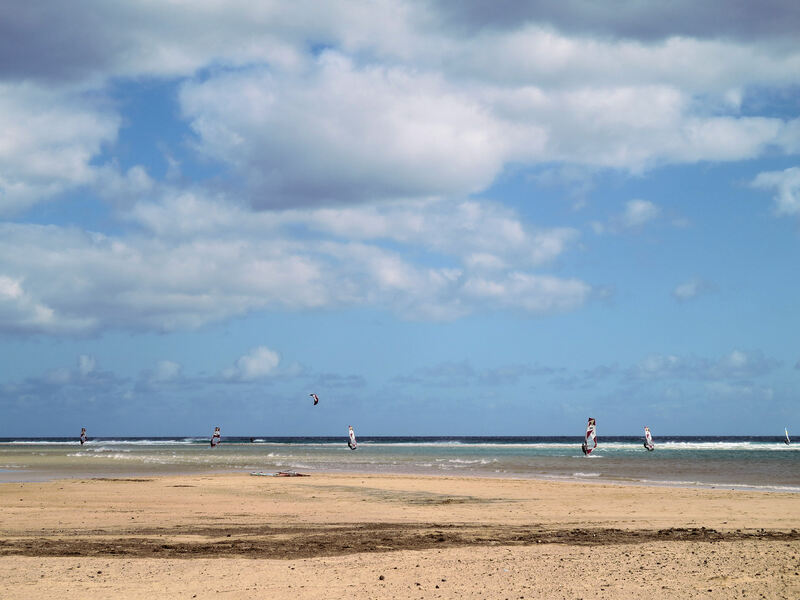 Fuerte+ventura translates as ‘strong wind’ and this eastern Canary Island lives up to its name. No wonder, then, that the island pulls in watersports people from all over the world, enjoying the challenge of the winds alongside the serene beauty of miles and miles of pure white beaches. The island has a long history. Wandering the streets of the original capital of Betancuria (founded 1405) is a journey back in time. 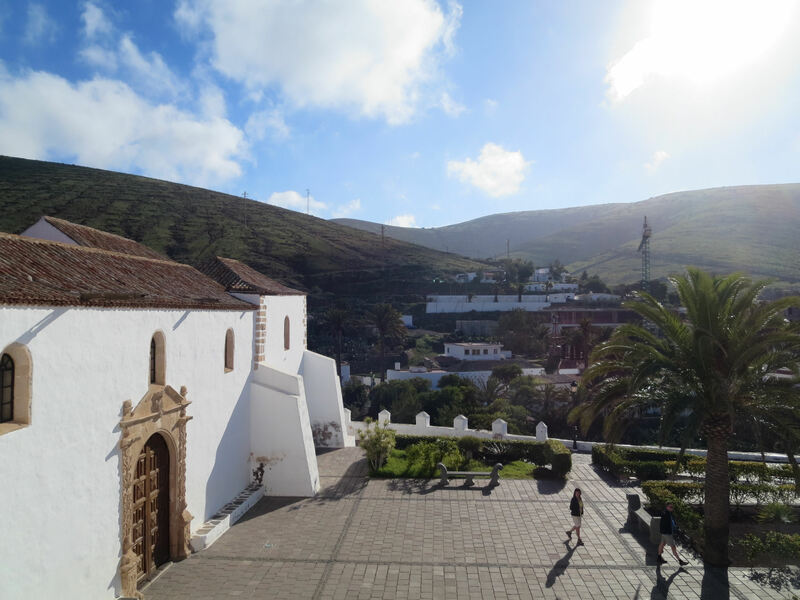 Established in 1405, Fuerteventura’s origianl capital of Betancuria is a step back in time. 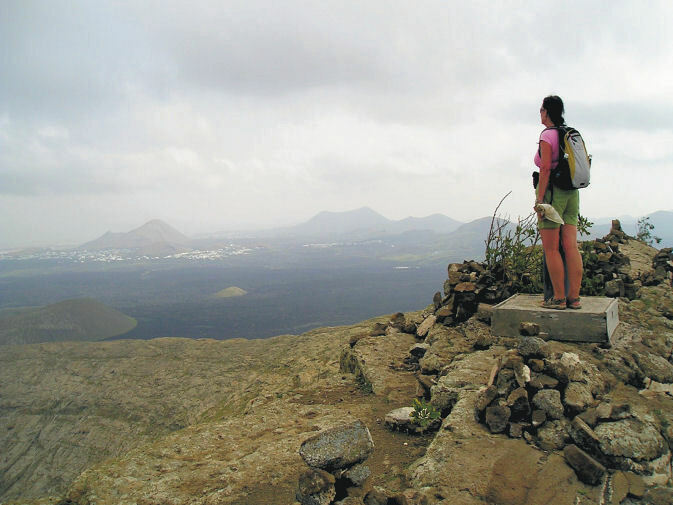 Get up high on one of the mirador viewpoints to see amazing views of the scattering of volcanic cones with a few precious patches of green in the valleys. There’s very little rainfall here so agriculture is an uphill battle. 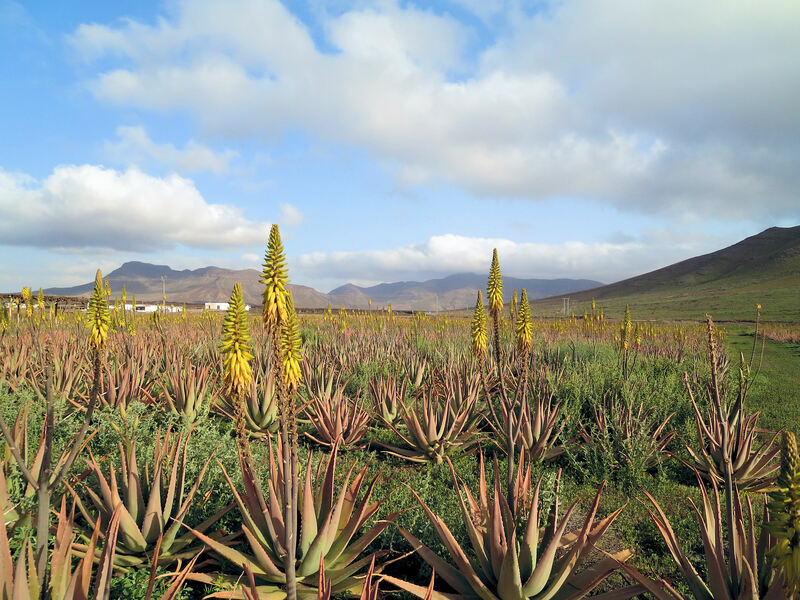 Goat farmers (delicious white local cheeses) and growers of aloe vera are more in tune with the harsh terrain and climate. 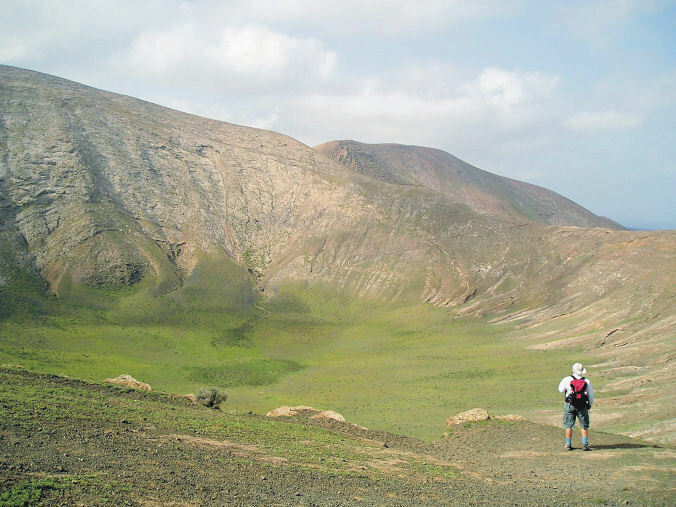 Now we have the raw data, our cartographer David is working on Discovery Walking Guides ‘Fuerteventura Super-Durable Map’ which we hope to publish in April 2015. 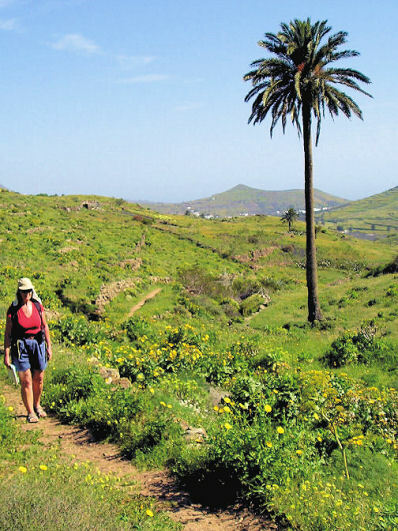 Our thanks go to Howard and Penny who recently returned from a walking holiday on the Canary Island of Lanzarote and have sent us these useful notes and updates for those who walk after them. We had a wonderful time and really had no issues at all in finding our way though a few little changes have arisen which we suspect arose after your visit. We particularly enjoyed some of the new routes. Walk 22 This has now been upgraded into a defined path with illustrative notice boards and you are advised that stepping off the path is punishable. The English version of the notices are written in best Brussels Eurocrat speak so it is quite entertaining but the beauty of the place is not lost. Walk 36 After the quite treacherous drop down to wp6 it was clear we were not wanted on the stone wall so we made a direct line for the extreme right end of the wall where we picked up the path. Looking at the footsteps we were not alone. Walk 33 We set off up the path from the Recycling Bins at the start only for a lady from one of the houses to shout across to say we were on the wrong path. Clearly we were not the first walkers she had re-routed. The bins have been moved ca 75m up the road. The route begins from the path by the bus stop. How you got to wp 4 in 29 minutes amazed us, we were fairly close to your timings throughout the island but it took us close to an hour for this part of the route. We also struggled from wp 4-6 turning left far too early, it would have been clearer if wp5 had not been detailed and the route was described simply as aiming from wp 4 to the right hand side of the saddle where the track is clear at wp6. 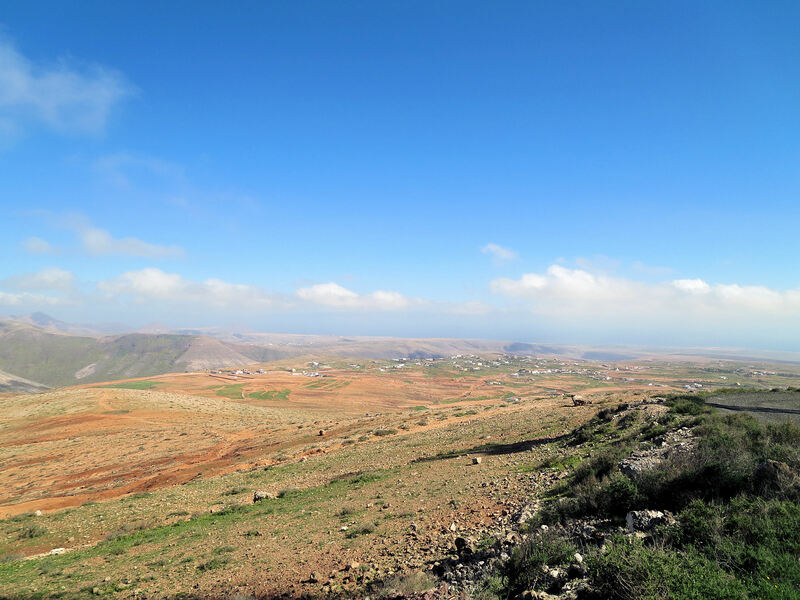 For those with restricted time we would combine walks 29 and 30 starting at wp1 in Haria and going directly to wp13 (a quick trip up to wp12 is well worth while) then continue to wp17 where you join walk 29 at wp4 and complete walk 29 from there. Finally we wondered if anyone else had the same experience as us in Ye (walk 36). We were met at the church by two delightful small dogs who befriended us for the day, sticking with us all the way round. Sitting with us when we stopped to eat and then on return trotted off. They seemed to treat us as their dog walkers for the day. Has anyone else performed this service? 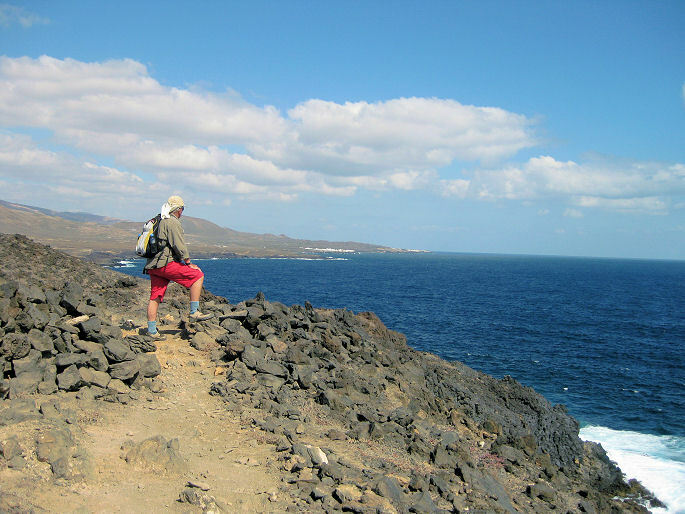 We see you are planning Fuerteventura, we have not been there so look forward to you guiding us around that island soon. One request though, please can you publish this with a ring bound spine, they are so much easier to work with. PS. Note for David, there is a new roundabout on the LZ30 where the LZ402 joins from Famara – a Cartologists work is never done.